The failed Central Bus Station, Temple Bar. | Come Here To Me! 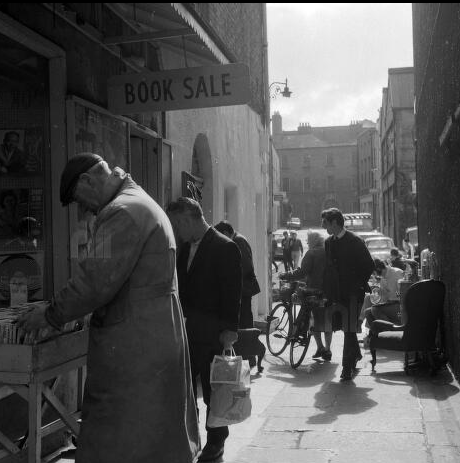 « CHTM walking tours for Dublin Book Festival 2013. The failed Central Bus Station, Temple Bar. Suddenly Dublin has become a shabby city – shabby because its centre is peppered with crude concrete structures, flashy mirror-glass facades and other inappropriate schemes which have no connection at all with the spirit of the place. Certainly there is much in the city today from this period which some still regard as architectural crimes against Dublin. Some controversial plans from the time however never made it to fruition, and one example is the proposed Central Bus Station in the heart of Temple Bar. 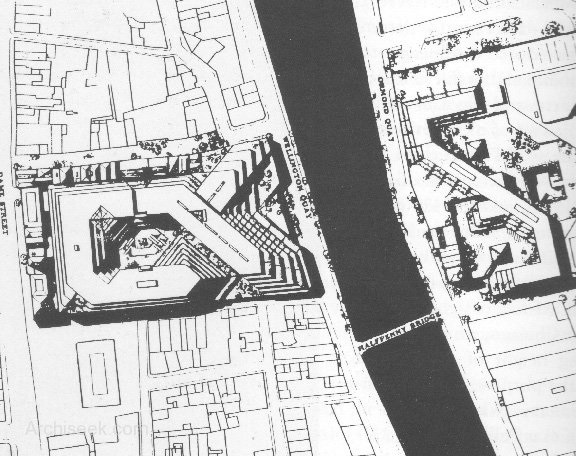 This huge development, which would have seen construction projects undertaken on both sides of the River Liffey, was one of the most divisive proposals in terms of city planning in Dublin in the 1970s and 80s. In 1977, the following proposal for a Central Bus Station was put forward. Designed by Skidmore Owings & Merrill LLP, this development would span the River Liffey, with development on Ormond Quay designed to complement that in Temple Bar. Looking at Dame Street and Wellington Quay on the map, the sheer scale of this proposal is apparent. It was planned that a tunnel under the Liffey would join both sites, and it was also planned to incorporate the DART into the site. The picture Haugh painted was of a vibrant, liberal area. He wrote of the Hirschfeld Centre, an openly gay community centre at the heart of Temple Bar, describing its disco as “one of the liveliest and musically up to date in town. Records are imported directly from London and, as a rule, are played months before they hit the radio and charts.” This centre had opened in 1979, and contained among other things a social centre, cinema and meeting place for Dublin’s LGBT community. A sign of the times. 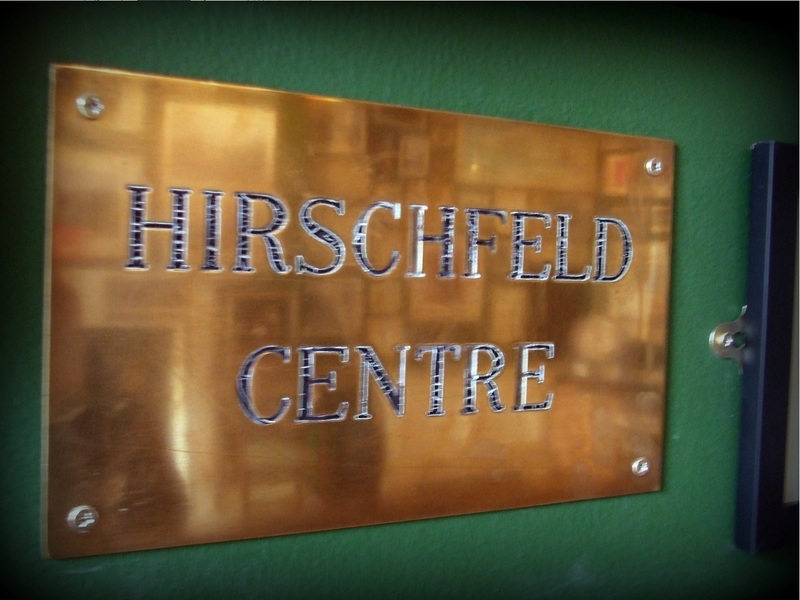 Taken from the front of the Hirschfeld Centre, it is now on display in The Little Museum of Dublin. The early 20th-century industrial building, which extended through a block from Temple Bar to the Liffey quays, provided the framework of spaces for artists to work in, although the conditions were problematic and at times hazardous. The activities of the artists – studios, exhibition space, cafe, sculptor’s annex – influenced the atmosphere of Temple Bar in the 1980’s, establishing the area’s reputation as a cultural hub and contributing to its regeneration as Dublin’s Cultural Quarter. Ten years later, all of this looks like so much pie-in-the-sky. In the first instance, the commercial property market in Dublin is in a state of almost total collapse, with the demand for new office space, not to mention shopping and residential- down to not much more than zero. And secondly, the lynch-pin of CIE’s scheme – the underground central station for DART – is looking more and more like a pipe-dream. It was not until July 1987 that CIE’s plans for the district were well and truly destroyed, with elected Councillors voting for the preservation and redevelopment of the area. By this stage the issue had become a mainstream debate, with Charlie Haughey vowing before the upcoming election that he would “not let CIE near” Temple Bar. By the early 1990s, the area enjoyed a sort of ‘official backing’, with Temple Bar Properties established with strong government funding, and the aim of organising the development of the area.Eric Zuelow notes in his history of tourism in Ireland since independence that £2 million was spent on the area in 1993 alone, with much of this money drawn from European Union development funds. Many (including this writer) would argue that the area has drifted far from its cultural and offbeat qualities in the years of protest. Yet while the Hard Rock Cafe, McDonalds and others may have moved in, it should be remembered that some of those who championed the cause of Temple Bar over 20 years ago still call it home. My grandparents lived in Temple Bar and that is where they got engaged to each other circa 1915. My grandfather also worked and lived over the premises with his employer in the 1911 census. My grandmother worked in a factory in Temple Bar in the 1930s, and lived around the corner on Wellington Quay. This was after she first came up from the country (Maynooth!). I delivered mail in Temple Bar in the mid 1970’s. It was a great place full of little workshops, Factorys and Little stockbrokers Offices, Import export operations. and then Charley Haughey came along and made a complete mess of the area and turned it into the mess we see today. I’m looking at those plans and boggling. How could they possibly have thought they needed a bus station that huge?! I still miss some of the second-hand clothes shops from the Temple Bar of the late 1980s/early 1990s. Anyone else remember “Rumours” on Crown Alley? It was small and dark and stank of mould, and seemed to be stocked with jumble-sale leavings, but everything was dirt cheap and if you had the patience to dig you could find some real treasures there. My grandfather’s office was on Temple Lane – he owned a wine importing business. The wine was bottled, labelled and stored in the cellars, which – according to my mother’s memory – ran right from the Temple Bar end of Temple Lane right under Dame Street. On another note – does anyone remember the Cheescake HQ in Crown Alley? Now that was cake heaven!